House Amberwood was established by Aislynn of Amberwood in the year A.S. XVI when she first joined the Society for Creative Anachronism, Inc (SCA), as a part of the incipient Shire of Darkwell in the Kingdom of Caid. Alaric Wulfgar, who previously resided within the Shire of Perilous Visions, Kingdom of the West, and then sojourned in Ansteorra and later still in the Barony of Drachenwald, Kingdom of the East; moved to the future Shire of Darkwell upon retuning from military service at the beginning of A.S. XV. Aislynn met Alaric in the autumn of A.S. XVI (1981 c.e.) through mutual friends who were working to establish a local SCA branch; they were wed in December, A.S. XVI. They remained active in the Shire of Darkwell, along with their daughters, until leaving Caid for the wilds of an Tirin A.S. XXII. For many reasons, participation within the Society ended following this move; however, in September A.S. XL, the Household rejoined the Society, with the intent of becoming active in the Canton of Porte de L'Eau, Barony of Madrone, Kingdom of An Tir. This name was registered in July of A.S. XIX (via Caid). Ermine, a stag's head erased between three roses sable. This household name was registered to Aislynn of Amberwood in July of A.S. XIX (via Caid). 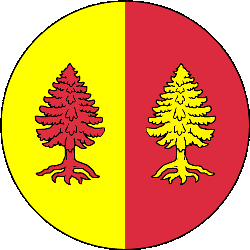 Per pale Or and gules, two fir trees eradicated counterchanged. This name was registered in January of A.S. XVIII (via Caid). Per pale sable and argent, two spears in saltire surmounted by a wolf's head cabossed within a bordure embattled, all counterchanged. The SCA was founded in 1966 in Berkeley, California by a group of science fiction and fantasy fans who wanted a theme party. Following the party, a group got together to discuss the idea of a medieval re-creation and re-enactment group (which has ended up being much like the Civil War, Revolutionary War or Buck-skinning re-enactment groups that were beginning to form in the US). In Britain, medieval and British Civil War recreation societies had existed for any number of years. The Californians incorporated as a non-profit educational society, started forming groups, and away they went.